The Annual Status of Education Report (ASER) 2018 published by education non-profit Pratham shows the prevalence of learning deficit and the poverty of basic reading and arithmetic skills among students in Indian schools. Mintanalyses the highlights of the report. The deficit is across government and private schools. Traditionally, students in private schools have fared better than their government school counterparts, but that’s a relative situation. For example, while 40% of Class VIII students in government schools can do simple division, the figure is 54.2% in private schools. But this success rate is three percentage points below that of 2012 and the same as in 2014. “Private school students are believed to have better family background, both in economic and education front. That’s a key differentiator,” said Pratham chief executive Rukmini Banerjee. Yes; there is gradual improvement in some segments and in some states. 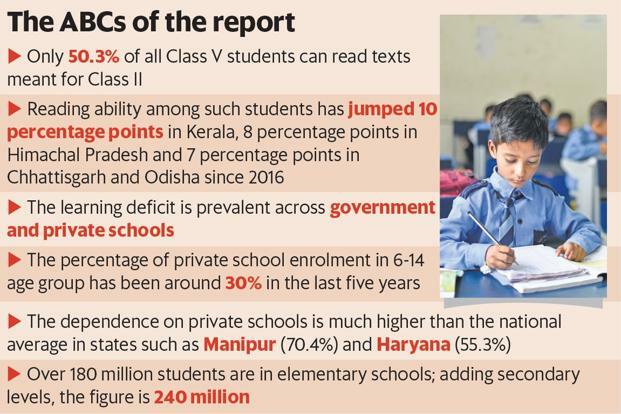 The reading ability among Class V students in Kerala jumped 10 percentage points in 2018 from that in 2016. In Himachal Pradesh, the growth is nearly 8 percentage points and in Chhattisgarh and Odisha it is around 7 percentage points between 2016 and 2018. Still, data from states such as Jharkhand, West Bengal, Gujarat, Rajasthan and Tamil Nadu shows a marginal dip in the same criterion for the same cohort. The situation has been almost static in the last five years. While 30.9% of students in the 6-14 age group were in private schools in 2018, the figure was 30.6% in 2016 and 30.8% in 2014. This is less than a percentage point growth since 2014. In Rajasthan and Uttar Pradesh, there is a two percentage point drop in private school enrolment. In Gujarat, Bihar, Jammu and Kashmir, it has risen by a similar margin. Private school dependence in Manipur (70.4%) and Haryana (55.3%) is much higher than the national average.